Created in 2007, Citémômes is a cultural association based in Rouen, Normandy. Actively led by Mathilde Milot, the manager who is specialised in cultural mediation concepts, with the help of a small and dynamic team of volunteers of all ages and coming from different horizons. Three years ago, Citémômes invested in the trendy field of knitting with its « Tricothé » workshops : a friendly way for Nicole, Mathilde’s grandmother, to share knitting know-how with other people and go outside of her home ! In 2015, « Tricote un sourire » (Knit a smile) was launched. An ambitious project which aims at encouraging the creation of links between people of different ages, backgrounds and circles. The main goal of this project, launched in the middle of the attacks of 2015 in France, is to bring people back together and to make everybody smile. As the Abbé Pierre said : « a smile is cheaper than electricity but it gives so much light ». 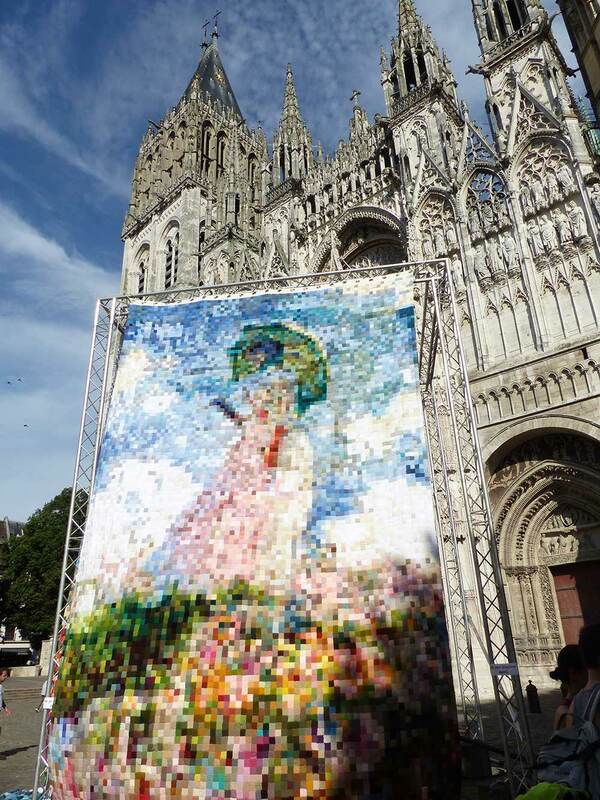 In 2016, the operation « Ensemble, nous sommes Monet » (Together, we are Monet) was initiated with the festival “Normandie Impressionniste”.The aim is to collect throughout the whole territory of Normandy, 5x5cm knitted squares for the creation of a huge portrait (6×4 meters) of Monet’s Femme à l’ombrelle tournée vers la gauche. A network of more than 200 boxes was implemented throughout Normandy to collect a maximum of these knitted squares. Picnics, Pompom parties at music festivals, workshops in and outside our association were also organized throughout the whole territory. Thanks to all of these we collected thousands and thousands of squares, way more than we actually needed ! We then assembled them together in a clever, well-thought and very organized process for two months in the summer of 2016. Finally in the end of August, we launched our first exhibition of Suzanne in front of the Cathedrale of Rouen, followed by a lot of other in different cities and events. For more information about her, you can click on Suzanne’s adventure. In 2017, the adventure goes on with a second artwork, from Monet’s Pont sur l’étang de nymphéas. Once again, everyone from children in school to elderly in retirement homes, participated to this new project, by knitting, counting and assembling little colored squares, and smiling all together. This new artwork will be exposed for the first time in New-York City, during the Vogue Knitting Live of January 2018. This salon is really important to us as we chose the bridge as a symbol for rassembling people from different circles, backgrounds and therefore countries ! From now on, all of our artworks are part of a bigger one about Monet’s garden. The aim of this multi-year project is to experiment with textile, materials and colors. To create a giant textile garden that will grow step by step with every installation we’ll make and every event we’ll participate to. So in addition to our emblematic squares, we now also propose to people to create flowers from textile (knitting, crochet, patchwork…) to participate ! This whole adventure is a great opportunity for the participants to discover the textile art, the rich heritage bound to the yarns, and also, discover or rediscover Monet and the impressionist movement. Its as well a great way to be together, participate together in one fun, artistic, and human project, and to bring smiles all around the world ! If you want to participate to this great adventure, you can knit your own 2×2″ squares (or crochet) and send them to our association in France ! Click here to find all the information you’ll need : How to participate ?